The sweeping vistas of the Rocky Mountains and the excitement of an ever-growing Mile High City are enough to make anyone think nothing bad could ever happen here. However, just behind the curtain of breweries and blue skies, dark and perverse secrets lurk in the shadows. 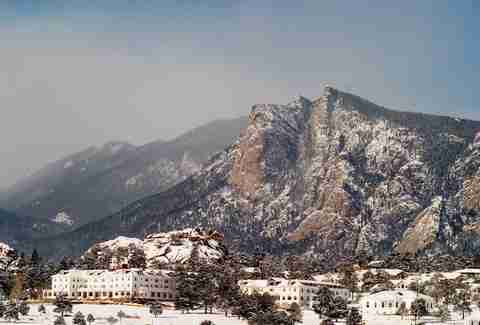 If you dare to venture beyond Colorado’s beautiful surface, you’ll uncover a past which lingers today in the form of mysterious figures, otherworldly noises, and apparitions that live in both our realm and the realm of the unliving. 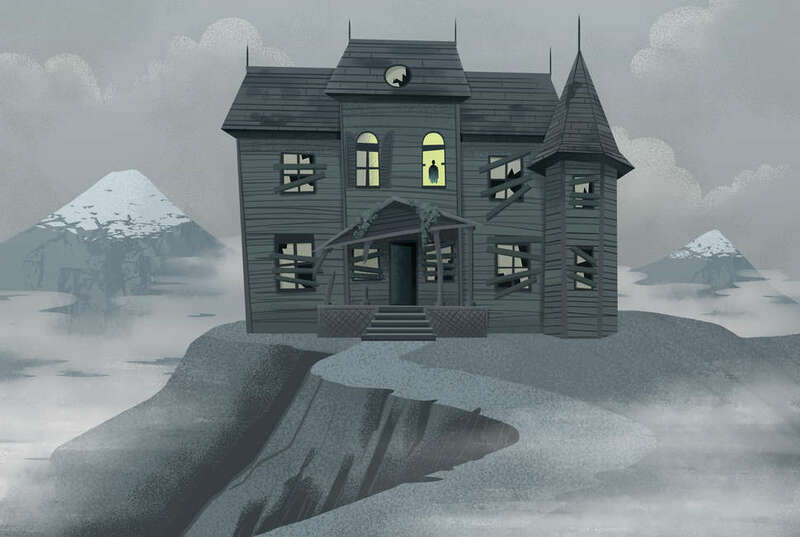 For those seeking ethereal experiences, these destinations are your best bet, but don’t say we didn’t warn you -- lurking around these haunted spots a little too long can be downright terrifying. With relics from Colorado’s mining past well intact, this ghost town is a popular destination for those looking to get a glimpse into the past. But as you explore the remaining buildings, including the previously bustling general store, stay alert… you might just get a peek at St. Elmo’s most well known former (and possibly present) resident, Annabelle Stark. The town was originally settled in 1878, and the Starks arrived in 1881 toting a young Annabelle along. The Stark children were kept quite isolated in the town, and despite having left at one point to marry, Annabelle mysteriously returned only a short time later and is now said to remain as the town’s supernatural protector. This place managed to freak out the Stephen King, the veritable king of scream, prompting the author to pen The Shining after a one night stay in the now infamous room 217. Although the film version was not shot at the Stanley, a later miniseries was... and both versions of the frightening tale play on a non-stop loop in the rooms. Built in 1909, there are over a century’s worth of ghost stories lingering in the halls here, including King’s sighting of ghostly children playing in the halls. Ever since, guests have reported a variety of strange noises, unsettling presences, and even some mysterious figures caught on film. Pro-tip: chat with the staff if you get a chance to visit, many have their own close encounters that they’re more than happy to share. Denver has many lovely parks that are welcome retreats for residents to enjoy some time in the outdoors, and Chessman is no exception. Well, except for one small detail. The park was also formerly Denver’s first graveyard. While some of the bodies originally buried there were moved by loved ones after it was decided that the land would be used for a park instead, many were left unclaimed. Enter E.P. McGovern. He was tasked with moving the remaining bodies, with a fee to be paid for each. So instead of moving them whole, he opted to hack up the remains so they’d fit into children’s coffins leaving McGovern a larger check to collect. Remains leftover from this self-serving horror were found as late as the 1960s, and tales of strange apparitions in the park (and the nearby Botanic Gardens) continue today. 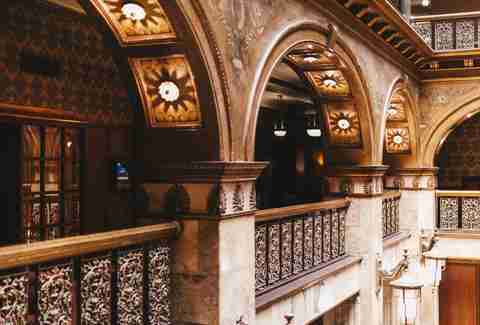 With a long history of famous guests including The Beatles, Ronald Reagan, and Taylor Swift, Brown Palace is one of Denver’s oldest and most luxurious hotels. But despite the afternoon tea service, annual holiday champagne cascade, and the sweeping grand atrium, it holds some dark secrets. In 1911, it was the scene of a double murder instigated by a lovers’ quarrel which left one of the potential suitors of Isabel Springer and a bystander dead. Along with that bit of true crime history, there are many more unexplained hauntings in the building including a former resident who continued calling the front desk long after her death, a ghostly string quartet in the dining room, and a baby’s crying that’s been heard from the boiler room. Founded as a mining town in the late 1800s, Central City is now known as a destination for those looking to head to the hills for a gambling fix in the casinos that now dot the area. But one thing hasn’t changed: the woman in black who twice a year appears in this hilltop cemetery above the town. Known as the “Columbine Lady,” she comes to visit the grave of John Cameron, a prominent former resident of Central City who died in 1884. Some believe she is his fiancee, appearing to leave flowers for her lost love on November 1st, the anniversary of Cameron’s death, and April 5th, a date for which the significance remains a mystery... much like the woman herself. 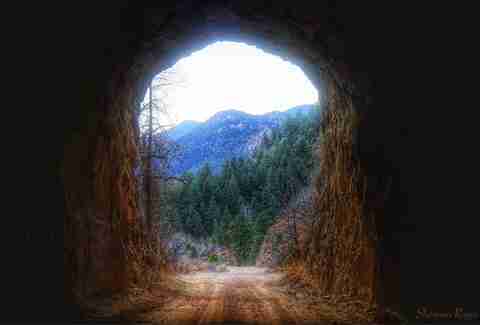 Originally built in the 1800s for rail use during the Gold Rush, three of the original nine tunnels located just outside Colorado Springs have since collapsed. 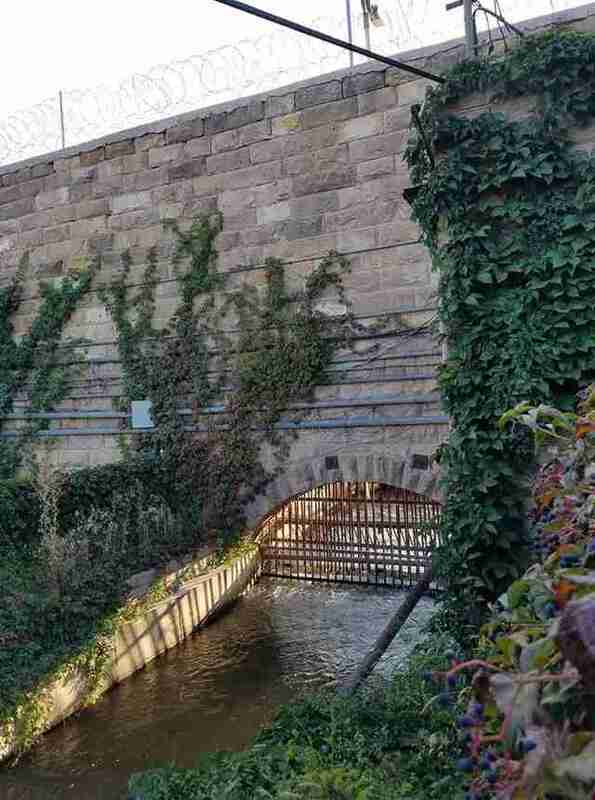 The remaining tunnels have been converted for vehicle use, while an ominous spiked gate blocks entry to the others. And that’s where things turn creepy. From stories of workers killed during construction of the tunnels to a tale about a bus filled with children that died in the third tunnel collapse, there are a lot of theories as to why this location may be haunted. But regardless, the fact remains that many reports of children’s laughter, dark figures lurking, and even dusty fingerprints left behind on cars that dare to stop in the still open tunnels surround this spooky destination. This sprawling five star hotel has a lot to offer for anyone seeking a relaxing and indulgent getaway. But along with the golf course, spa, and nearby zoo, there’s one feature you won’t find in any brochure. Staff and guests alike have reported the presence of a woman, often in the penthouse where Julie Penrose, co-founder of the property once lived. While not confirmed, Penrose’s death is said to have been surrounded by a strange occurrence in which she went missing and was later found, confused and shaking in the woods nearby with no memory of how she got there. She passed away a week later, and perhaps her spirit remains, watching over the property and seeking answers about her own mysterious death. This building was originally a women's prison constructed in 1935 and it remains connected to a still operating prison today. Now, you can tour the site and learn more about its storied history. In fact, you might even get up close and personal with some of its former residents. People have reported orb sightings, distant voices, and other mysterious signs from beyond, including the lingering smell of tobacco. Perhaps some of these odd happenings can be traced back to some of the prison’s notorious past inmates including a convicted cannibal and a 12-year-old jailed for murder. Sometimes referred to as the most haunted road in America, this small stretch of asphalt outside of Denver is the source of many a terrifying tale. Rusty metal gates were previously left behind from a mansion where a man supposedly became possessed by the devil before burning down the house and killing his family. This became known as the Gates of Hell, although the structure is now gone, the paranormal activity has not slowed down. It is also said that the road was built on Native American burial grounds, and that it’s been the site of many tragic accidents. Reports of headless animals left behind, strange voices chanting, figures appearing then disappearing from sight, and bloody handprints spattered on signs have all been rumoured in the area. Molly Martin is a freelance writer in Denver, Colorado who plans on avoiding all of these frightening places. Follow her Mile High adventures @mollydbu on Twitter and Instagram.